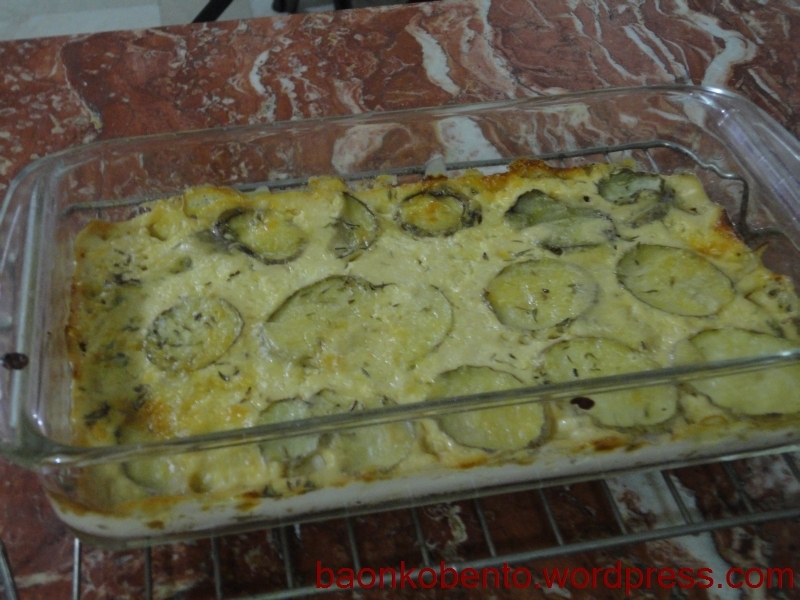 Potato gratin is what I ended up doing for this week. I still had a bunch of potatoes in the vegetable compartment that needed to be consumed, and I thought that this was the perfect dish. My source is again Soup Addict. The difficult thing about this is that she didn’t include the recipe itself because she used a Dorie Greenspan recipe. She just described the process, with beautiful pictures of each step. I had to guess at the proportions and had some of my own substitutions. I used 4-5 medium potatoes, and sliced them into thin rounds by hand. My mandoline isn’t big enough for those potatoes. I kept the skins on advice from one of Soup Addict’s commenters. I used 2 cans of Nestle cream, and heated them up with a smashed clove of garlic swimming in it. I also grated up half a bar of quickmelt cheese, and half a bar of mild cheddar. I set my salt, pepper, and dried thyme cellars nearby, and prepared to assemble the gratin. The bunch of sliced potatoes didn’t seem much at first, so I used these two containers I have pictured above. 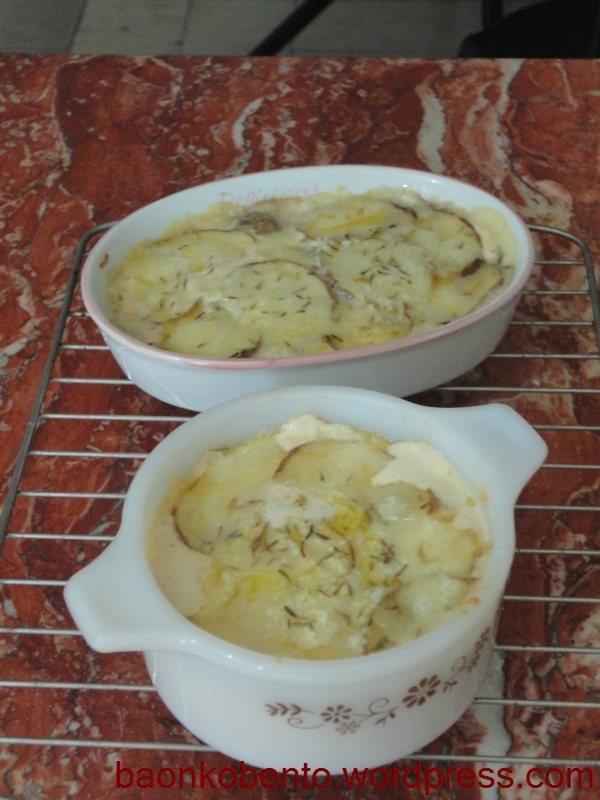 I put a layer of potatoes at the bottom, then sprinkled some grated cheese on top. A dash of salt, pepper, and dried thyme followed, then a generous dollop of garlic-infused cream. I repeated these until I got to the top of the dish. I fired up my oven to about 180C, and put these two containers in. It’s really flat, only about a couple of layers. I should have just gone with this big container to begin with. I left these to cool down, then packed them in individual serving containers for easy grabbing for baon. 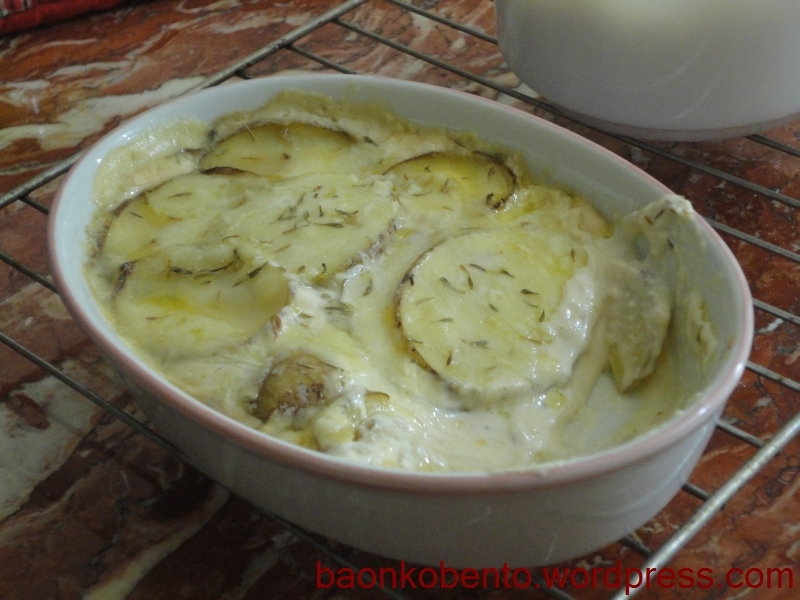 They were just as yummy as I had imagined, with the potatoes soaked with the garlic-flavored cream. The garlic was just right, not too strong. If your taste can stand a bit more strength, you can add another clove or two in the infusion step. I think I sprinkled way too much salt in some places, as they came out weirdly salty in some of the bites. The thyme was a nice touch, and opens up some other choices of herbs in future experiments. Nice melty cheese is also awesome, and I think putting a layer of grated mozzarella on top would be interesting.